Hey Everyone! It’s been a while! This week, I wanted to talk about an annual tradition here at Saint Rose, Rose Rock! For those of you who are unfamiliar with what it’s all about, here are some of the basics. 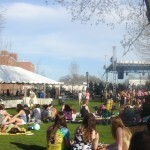 Rose Rock is a festival of fun and music held on the campus quad. 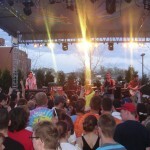 Each year, several bands take stage and provide hours of musical entertainment and fun for the students. There’s also a headliner band that takes stage at the end of the event. This year’s headliner band is Streetlight Manifesto! In year’s past, headliners included We The Kings, Say Anything, and Cute is What We Aim For. Besides the music, there’s also a multitude of other activities such as bouncy houses, contests, fried dough, a dunk tank, and other club sponsored events. It’s certainly an experience that I would not want to miss! You can find out more information by checking out the Rose Rock Facebook Page. As some of you may remember, Rose Rock was held indoors last year because of the “Kegs and Eggs” incident that occurred during St. Patrick’s Day weekend. However, it WILL be held back outside this year and I could not be more thrilled. I am excited for the day and I hope you all are too. I would also like to give a major thank you to Meagan Corbett, the Student Association Director of Social Activities, and her committee for planning the entire event. Meagan attended countless meetings, made hundreds of phone calls, and sacrificed so much of her time to make sure that this event can happen. I’m excited to see how it goes! I look forward to seeing you all there! WAIT- I missed Say Anything?! That is not cool. When will they sell the shirts? Will they be sold any other time? Yes! T-Shirts will be on sale the day of the event as well. TONIGHT is a presale, beginning at 7:00pm. The first 50 people will be eligible for a special edition Rose Rock Shirt. You won’t want to miss it! Great, thank you! Do you know what time they will start selling them Saturday? Early in the morning? I believe shirts will be sold on Saturday beginning at 11:00am. If you have any further questions about T-Shirt sales, I would recommend getting in touch with Meagan Corbett from Student Association as she is in charge of the event this year! !